Registered nurses treat illnesses and give health advice to patients. 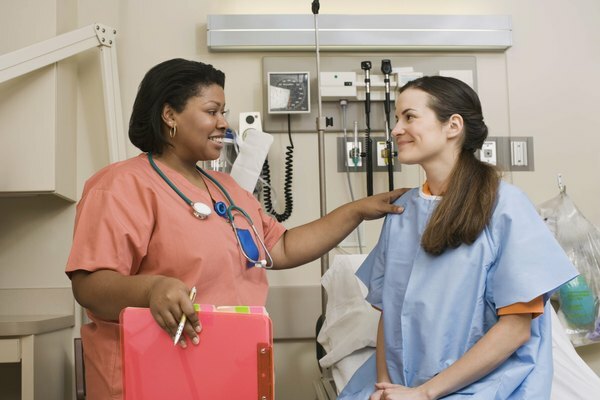 To become a registered nurse, students usually complete one of three possible educational programs: a diploma program, an associate’s degree program or a bachelor’s degree program. Educational programs typically combine classroom lectures with clinical experience, and a bachelor’s degree is often required for nurses who wish to advance to administrative staff positions. All registered nurses must hold a state license, which is earned by first obtaining an accredited degree, then passing the National Council Licensure Examination. Registered nurses earned an average annual salary of $69,110 a year, or $33.23 per hour, according to the Bureau of Labor Statistics data for 2011. The middle 50 percent of this group earned between $53,770 and $80,390 per year, equaling $25.85 and $38.65 per hour. 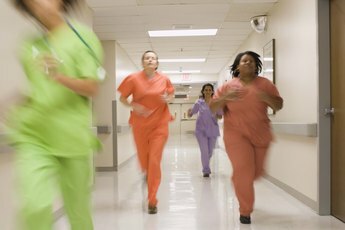 The bottom 10 percent of registered nurses made $44,970 per year, while the top 90 percent took in $96,630 per year. Registered nurses who worked in the industry of personal care services took in the highest wages, making $85,940 per year, according to 2011 BLS statistics. Other lucrative positions for registered nurses included working for lessors of real estate, where they earned $81,850 annually, and securities and commodities brokerages, where they made $81,090 per year. Registered nurses working in the oil and gas extraction industry made similarly high salaries, earning $80,700 per year, as did those within the medical equipment and supplies manufacturing industry, with an average salary of $80,290 per year. In comparison, general and surgical hospitals were the employers with the highest levels and concentrations of employment, but registered nurses earned only $69,810 annually. California paid its registered nurses the most of all states. They made $90,680 per year on average, according to the BLS. Other top-paying states were Massachusetts, with an average salary of $86,810; Hawaii, where registered nurses took in $83,950 per year; Alaska, where they earned $82,080; and Nevada, where average earnings were $77,840 yearly. According to the BLS, all of the country’s top 10 highest-paying metropolitan regions were located in California. Registered nurses made the most in the Vallejo-Fairfield area of California, where annual earnings were $120,540. California was also home to four of the five top-paying non-metropolitan regions of the country for registered nurses; nurses earned the most in the Northern Mountains Region, where the average salary was $93,930 a year.